This Christmas was my first as a single mom. The fallout from divorce is great.... it is easy to place blame, be angry, be hurt and get mired down in your own little pity party. I have tried, and not always succeeded, to behave with grace and dignity. I make a very conscious effort to not say bad things about my ex in front of my kids and to encourage and nurture their relationship with their dad. To undermine him in their eyes only hurts them... I really have nothing to gain from it. Regardless of my failed relationship with him, their relationship with him is not over. In fact, it is really just beginning. He is their dad... their only dad... good, bad or otherwise, he is the one and only dad they have. And as much as I can do to make that a positive relationship, I feel I am obligated to make that effort. But.... it is hard. It is hard not to say the negative and hurtful thoughts that go through my mind. It is hard to withhold the things that happened, or didn't happen, that hurt me... that left me feeling betrayed and very much alone and abandoned. I have to remind myself... that is my relationship with him... not theirs. They have to define their relationship with their dad... it is between them and him.... they have to decide how they feel about him as a person and as a father. So with all that being said... back to Christmas. Many gifts were bought, most of which were not nearly as well received as I had hoped.... and that ever feeling of competing with the ex was always in the back of my mind. I didn't want it to feel like a competition and most of the time, it didn't.... but, every now and then, I was made aware that his gifts had "won" this Christmas. "They are just things" I had to tell myself. "I am their mom and no-one can take that away or lessen the importance of my role in their life" (even if my gifts didn't "wow" anyone). It is a simple metal sign I bought at Hobby Lobby... but I love it. I love the simplicity of the message. I love how it applies to really every aspect of my life... I love that it is a gentle reminder to treat people well... to react with compassion... and just to be kind. Is there really anything simpler than that? "Be Kind"... so simple and yet so powerful. So it is with this attitude I try and face each day. I finally managed to get it hung today. It's funny, because when I asked the kids where we should hang it, they both suggested the one spot I had in mind. 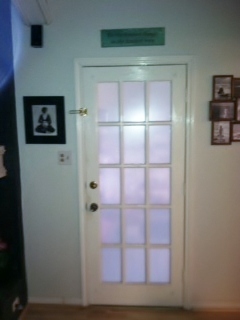 Oddly enough, it's over the door that leads to my "cake room" (that's what we call the room that contains the bazillion cake baking/decorating/refrigeration and storage tools needed for my business). It's also the first thing you see when you walk into our front door. What a lovely reminder to tap us on the shoulder each day. So that's what I'll leave you with.... "Do the kindest things in the kindest ways..."
Elaine, you do such a great job being kind. I could learn a lot form you. Remember to be kind to yourself. Awww... Thanks, Hanna:) And I am trying to be kind to myself as well... that one is a bit more difficult, but I'm trying!